If this welcoming hug between Prime Minister Modi and President Obama is indicative of diplomatic goals, then President Obama is ready to Think India. Up until last year, Modi would not have passed through customs in the United States because of the deadly anti-Muslim riots of 2002 during his governance over Gujarat state. He was never indicted for having any role in the event and so the US government is willing to forge stronger relations with the new PM. 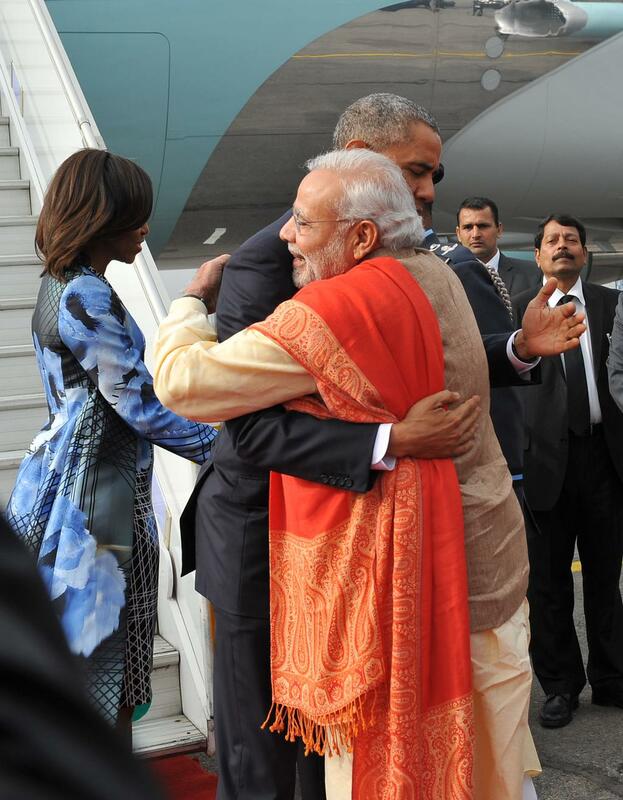 Modi has already visited Washington this past September and now Obama is wrapping up a 3-day visit in India. According to Julie McCarthy, India’s government expresses a similar sentiment; a foreign ministry spokesman said that his nation is working to ‘re-energize’ engagement between the democracies which has been developing more under the Obama administration. This 3-day date was highlighted with Obama being honored as the Chief Guest at the Republic Day festivities in the capital for the anniversary of its constitution’s implementation. 1-Renewal of a 10-year defense agreement. What a TOTAL JOKE.. This is what this SO CALLED PRESIDENT calls FOREIGN POLICY??? Mostly likely YES since he has alienated The United States with just about every other country that once LIKED US.. Guess India needs a few more BILLION, so be nice to obamanutjob. All part of his bigger plan to slowly diminish what America once stood for. His plan is all falling in place and Americans sit here and smile, such a shame. I’m not sure I understand your point; how does re-establishing or strengthening a relationship with India destroy what American once stood for?